Greetings Mr. Phelps. Your mission, if you choose to accept it: distance Tom Cruise in the public eye from the cult of Scientology before the $200 million “Mission Impossible 5: Rogue Nation” hits theaters on July 31st. The doc was so damaging in portraying Cruise as a nutty robot who ordered the bugging of Nicole Kidman that again someone– Cruise himself, his reps– is trying to change the conversation. It started with supermarket tabloid The Star. Strangely, both Esquire and Redbook– Hearst magazine websites– then quoted The Star. The lemming like Hollywood Reporter turned it into a video report. The gist? That Cruise, who hasn’t seen Suri in almost two years, will leave Scientology because the cult won’t let Cruise be involved with her. Cruise isn’t leaving. He’s so embedded in Scientology, a minor thing like not seeing a 9 year old girl isn’t going to pry him away. Over the years he’s involved his entire family– sisters, mother, adopted children, nieces etc– in the cult. To leave would mean something akin to removing US forces in their entirety from every foreign outpost. Not happening. And why isn’t Cruise talking to Suri? Well, Suri and her mother, actress Katie Holmes, have been “disconnected” from Cruise by Scientology. They are enemies. Cruise cut Kidman off the same way, and cut her off from their adopted kids. Last year, Holmes moved from New York to Los Angeles to try and get closer to Cruise geographically for Suri’s sake. It didn’t work. Now Holmes is living in New York again with Suri as she prepares to direct her first film for Tribeca Productions. The timing of it all couldn’t be better: Holmes is in pre-production to start shooting the first week of August. Cruise is coming to New York the last week of July to promote “Mission Impossible 5.” They are all descending on the same point at the same time. Who will be the first brave person on the red carpet to ask Cruise if he’ll see his daughter while he’s in town? What possible explanation could he have to keep ignoring her? More importantly, where is all this Tom is leaving Scientology crap coming from? 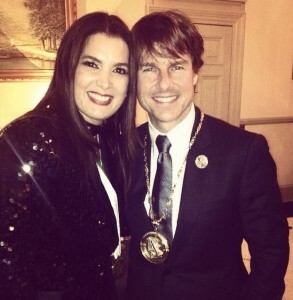 Last fall, Cruise was photographed wearing his Scientology Freedom from Sanity medal at the group’s UK gathering. Sources who monitor Scientology in general say Cruise has never been deeper into the group or more behind his BFF David Miscavige, the group’s leader.